Watch a video clip for a brief history of the Normans. Find out about King Harold and his rival, William the Conqueror. Why William won at the Battle of Hastings. Britain’s long and varied history comes to life with intriguing facts, stunning illustrations, photographs, detailed reconstructions, paintings, maps and family trees. Includes a factfile with places to visit and internet links to recommended websites via the Usborne Quicklinks Website. Beautifully presented with a cloth cover, dust jacket and ribbon marker. Beautifully jacketed, this compendium of British history has a cloth binding and a ribbon marker. Encompassing each period from the pre-historic to the new millennium, information is delivered in digestible chunks, complemented by carefully selected illustrations in a fluid style that changes to reflect a sense of each era. 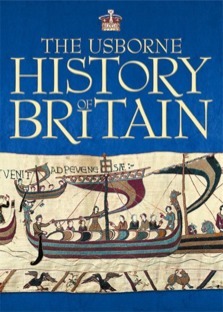 The most immediately striking feature of this substantial history of Britain is, without a doubt, its sumptuous design. Across double-page spreads, muted pastel-colour backgrounds are used to offset a stunning range of illustrative material: a Victorian railway poster hangs above a reproduction of Turner's Rain, Steam and Speed: a medieval manuscript is superimposed against a photograph of Beaumaris Castle; each page turn brings new and yet more exciting visual treats. A covetable resource. The contents are straightforwardly split into easily accessible chronological sections, which unhampered by the limitations of the curriculum - explore aspects of everyday life, encouraging readers to make links between social, economic and political developments, and intellectual and cultural history. Extensive supplementary material is contained in an imaginative and wide-ranging "factfile", which includes details of Usborne's useful Quicklinks website plus suggestions for places to visit, and annotated lists of historical fiction, films and TV series. The text is lucid and readable. This is a book no school library should be without. From hairy caveman to The Iron Lady, this book tells the complete history of Britain, taking in regal Romans, noble knights and revolting peasants along the way. Bright images, cartoons and quirky fact boxes make the pages burst with life. At the back, a snaking timeline provides a neat historical overview. It might look like a hefty tome, but it's actually a fun first reader in British history. From the Ice Age to the 21st century, this book tells the story of Britain, its people and the events that have shaped their lives. It's a treasure trove of information written in an enlightening and entertaining way and will arouse a passion and enthusiasm for the past. Follow the dramatic developments and twists and turns of Britain's history, and find out about characters from all walks of life - from conquering kings, revolting peasants and troublesome priests, to intrepid explorers, cunning inventors and outrageous artists. This book is a classic that no family bookshelf should be without.